Helgi Halldor Austman (Ph.D.) was born in Vidir, Manitoba, the only child of Anna and Halldor Austman. His grade schooling, including two years by correspondence, was completed in Arborg and Teulon. In 1948, after three years at the University of Manitoba, Helgi graduated with a BSA, receiving the Lieutenant Governor’s Gold Medal. While in university Helgi married Lillian Arnason, who became his partner, support and companion for life. They had three children, Signe, Larry and Brian. Helgi’s career began as the district Ag Rep for Teulon during difficult times for Interlake farmers. Working hard to improve conditions, he quickly saw the potential for the 4-H movement to develop young people. Recognizing his ability, the Manitoba Department of Agriculture promoted Helgi to Assistant Director, Extension Service. He rose quickly through the ranks, becoming Assistant Deputy Minister of Agriculture responsible for Rural Development. 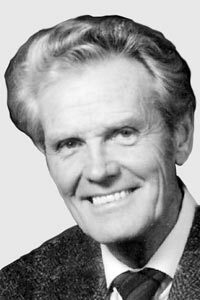 Helgi took time out to pursue graduate studies at the University of Wisconsin, where he obtained a Master of Science in 1959 and a Ph.D. in 1961. During his distinguished career, he served as President of the Agricultural Institute of Canada, the Western Canadian Farm Safety Conference and the Canadian Society of Rural Extension. He served as Chairman of the Advisory Council on Scientific Affairs and the Manitoba Veterinary Services Commission. Helgi was a Charter Member of the Manitoba Institute of Agrologists and the Canadian Society of Rural Extension. He was made a Fellow of the Agricultural Institute of Canada in 1984. After over 30 years of service with Manitoba Agriculture, Helgi retired and moved to Gimli. During this period, the Austmans worked overseas with CIDA in Guyana, Swaziland and India. Helgi and Lil became coordinators for the International Exchange Association based in Denmark. Helgi also served as Councillor in the Rural Municipality of Gimli. Active in the Rotary Club of Gimli, he and Lil hosted many students from the Rotary International Student Exchange. During this time, he served as President of the Rotary Club in Gimli and District Governor. He served six years on the Board of Governors of the University of Manitoba. Helgi Austman was proud of his Icelandic heritage. He served as President of the Icelandic National League and was an active member of its Gimli chapter. He also served as a Director of the New Icelandic Heritage Museum. He was a member of the Guttormor Memorial Committee and the Rural Municipality of Gimli Centennial Committee. Helgi Halldor Austman was recognized as a person of vision and leadership – a real “people person” who recognized the importance of community life.